Once you've experienced Dolby Atmos, it's really hard to go back to anything else. Like flying first class on a business trip, then coach on vacation. Fortunately, getting the right speakers for Atmos isn't difficult, and is actually quite affordable. 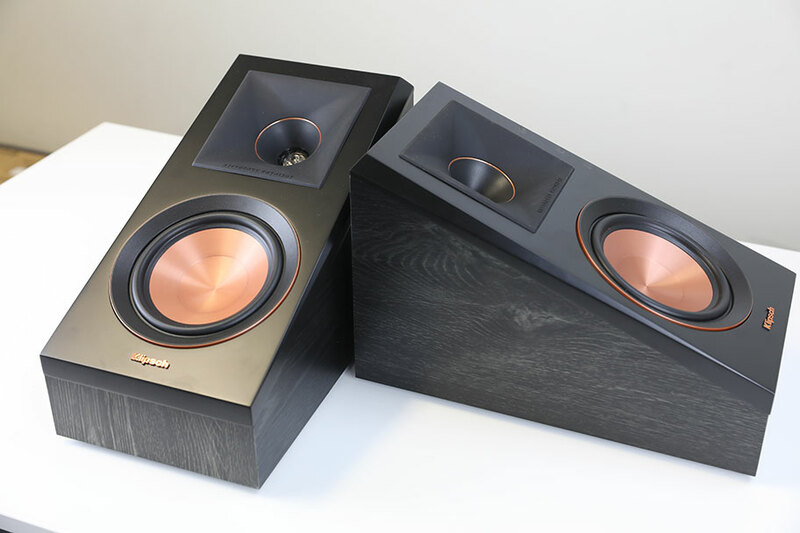 Klipsch recently joined the game with their twin RP-500SA Reference Premiere Atmos speakers. In this review, we break down the RP-500SA's sound, design, packaging and accessories, specs and more. For alternatives, check out our list of the best home theater systems. The Klipsch RP-500SA Reference Premiere Atmos speakers are beasts. Big, bruising, imposing monsters. They can either be mounted on top of a pair of floorstanding speakers, or wall mounted; both of these options have subtle differences in the character of the sound, and it's worth sharing our experiences with them. The first thing we did was what we consider the most traditional Atmos speaker technique, which is to position them on top of a pair of floorstanders with the drivers pointing upwards. The idea with this technique is to bounce sound waves off the ceiling and create height effects. You can read more about how this works, and about what Dolby Atmos is, here. After watching several Atmos Blu-rays in a variety of genres, we came away mostly impressed with the overall sound of the RP-500SAs in this particular configuration. Traditionally, bouncing sound off the ceiling does have its limitations. That's something that other companies, like SVS, have sought to change with their excellent Prime Elevation height speakers (full review here), which cost $399, same as the Klipsch. 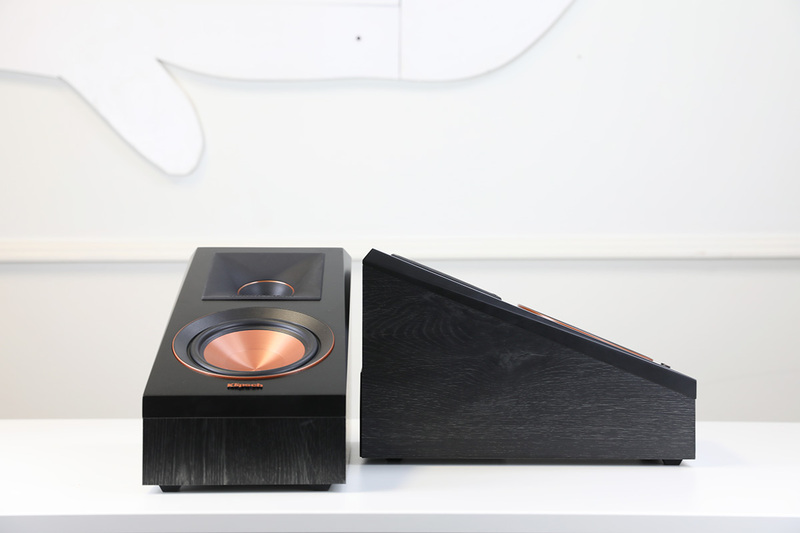 With the similarities in design, it's an idea that Klipsch are clearly following their lead. But overall, we didn't feel like we were being short-changed by the upward-firing position. It honestly felt like there was some serious activity going on over our heads. The height information was solid: bullets flying, helicopters, a giant Pez dispenser (Ant Man and The Wasp, if you must know). It genuinely felt as if we were getting the best out of our audio mix. We did have to crank the overall volume of the RP-500SAs in relation to the rest of our system, but we still felt like power wasn't a huge issue here. For the most part, these speakers did a great job. Like the Prime Elevation speakers, the RP-500SA are angled, meaning you can mount them high up on your wall facing downwards. This is where you will hear an extra bit of clarity. When the speakers are pointing downwards, without having to bounce sound waves off the ceiling, the height information in the movie mix becomes even more pronounced. We loved how dynamic and natural it felt, and how smooth the overall audio quality was. Positioning, for the most part, was very good – although we did occasionally find ourselves wishing for the precision that a pair of pricier speakers, like the KEF Q50As, offer. Those speakers are a bit old now, but still among the best available. They cost around $500 per pair, same as the Klipsch. Adding the RP-500SAs to an existing 7.1 home theater system and turning on the Atmos will instantly upgrade your sound, and make your movies that much more immersive. 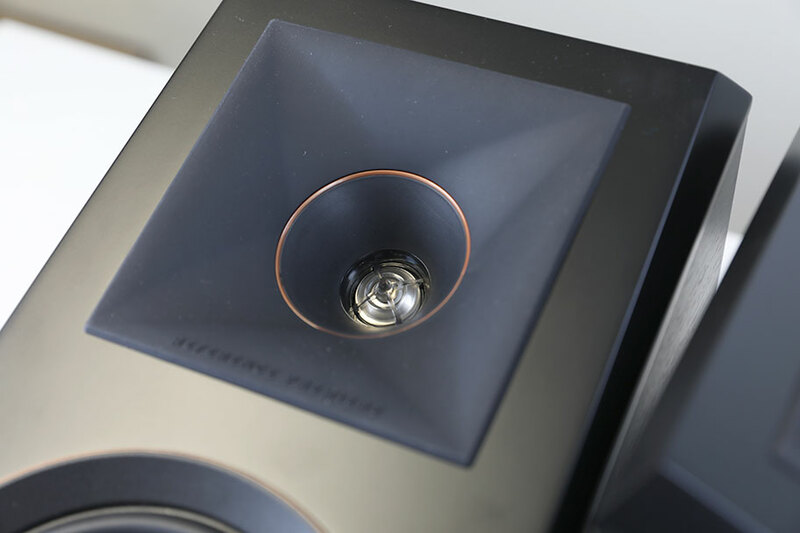 As in many of their other speakers, Klipsch have installed their trademark Tractrix Horn technology to help improve the sweet spot and overall audio presence. That, plus a small vented tweeter, gives the RP-500SAs a surprisingly light and agile sound signature. There's a genuine sense of balance to the mix; cheaper speakers, like the $150 Onkyo SKH-410, tend to overload the space, mistaking low-end thud for clear information. That's definitely not the case here. These speakers may not be at the top end of the market, but we were surprised and delighted at just how balanced they felt. A majority of balance was thanks to high end, which felt detailed and precise. Klipsch definitely have a formula that works: the combination of low-end warmth with clear highs. The height information didn't sound quite as impactful as the aforementioned Q50As, so there is clearly a little bit of work to be done. But overall, we had a lot of fun with them, and it was a pleasure to try out Atmos mixes we'd tested in the past on other systems. It's also worth noting that, while me mostly stuck to Atmos, we also tested out DTS:X surround sound, which worked just as well. Our loyalties still lie with the former, but it was good to see the RP-500SAs performing well in different tests. We only wish we could have compared them to the Klipsch RP-140SA, an older pair of Dolby Atmos speakers with a similar design. From our memory, there wasn't a dramatic difference, but if you've heard both side-by-side, please let us know your thoughts in the comments! One thing you can do with the RP-500SAs is use them as regular surround speakers, be they front, rear, or side. There's even a switchable crossover to help with this. However, this is an area where we found them lacking. 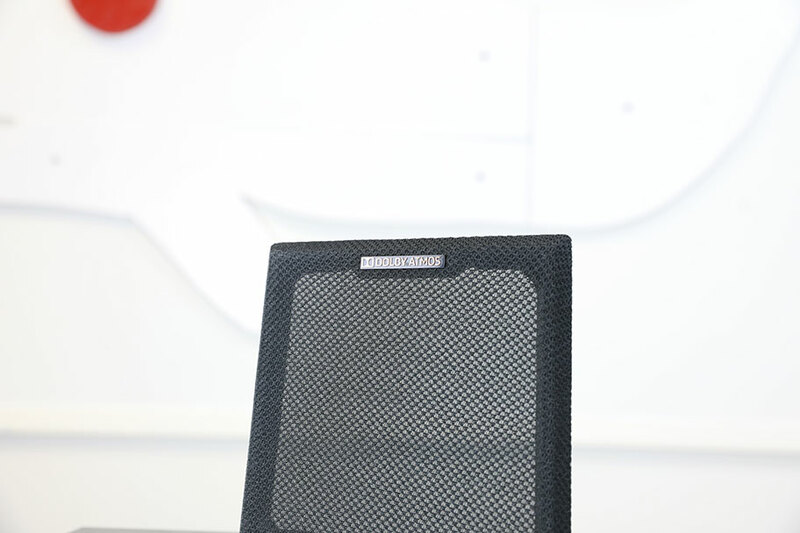 We tested them as a pair of rear speakers, and it was clear from the start that it was forcing them into a role they were slightly uncomfortable with – like making your kid dress up for his class photo. They were fine – they smiled, as it were – but we never felt like we were getting the full picture. If you do want a good pair of surround satellite speakers, why not try something like the $100 Fluance SXBP2? Not only are they cheaper, but they do a slightly better job in our opinion. Like the SVS Prime Elevation, the Klipsch RP-500SA drivers are set at an angle – but that's where the similarities end. In almost all cases, the RP-500SAs are bigger and heftier. Here's an excellent example. You can, in a pinch, simply position the Prime Elevations on a high shelf, standing on their narrow end with the drivers angled down towards the listening position. You simply cannot do that with the RP-500SAs. They are just too top-heavy. This isn't a negative, as they are very clearly designed to be either wall-mounted or upward-firing, but it gives you an idea of the type of speaker you are dealing with here. 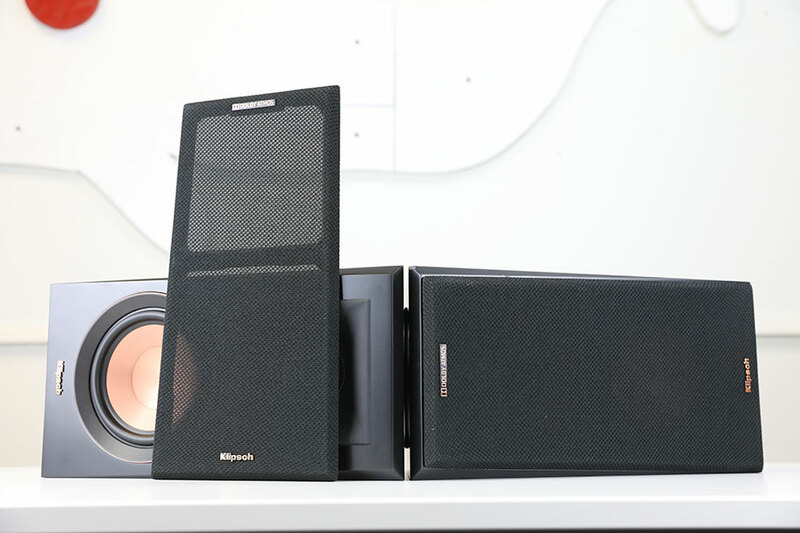 They have the trademark Klipsch color scheme of black and gold, and there's no question that they look incredible. We've always loved the company's instantly-recognizable aesthetic, and it's in full effect here. The speakers weigh a good 8lbs each – much heavier than comparable Atmos models like the ELAC Debut 2.0 A4.2, which are half the price at $250, and lighter at 5.5lbs a pop. The frame is MDF - Medium Density Fibreboard. It's a common enough speaker material, appearing in both high-end and entry-level speakers, and the form it takes here is robust and solid. 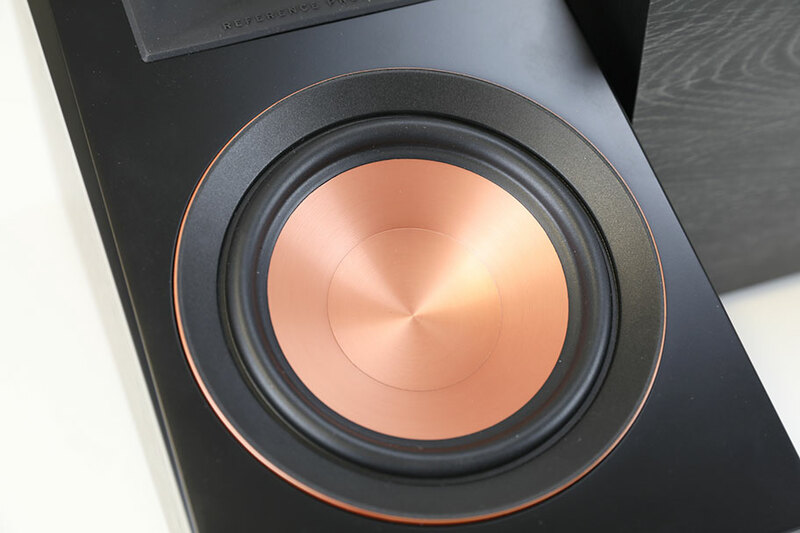 There are four sizeable rubber feet on the long side of the speaker, to keep the top of your floorstanders pristine, and overall the sense of solidity and quality shine through. Small things, like the raised Klipsch logo under the woofer, really make a difference. Unfortunately, There are some downsides to that size. When using in upward-firing mode, the standard practice is to position a Dolby Atmos height speaker on top of an existing floorstanding speaker. On many of the floorstanding speakers we tested, however, the effect was not good. That's because the RP-500SAs are huge – far bigger than many floorstanders. As a result, they often hung off the front and back. They worked just fine, but looked a bit silly in our office. At the time of testing, our A/V receiver cabinet had some extra space on it, so we were able to position the speakers at either end, but this wasn't ideal. 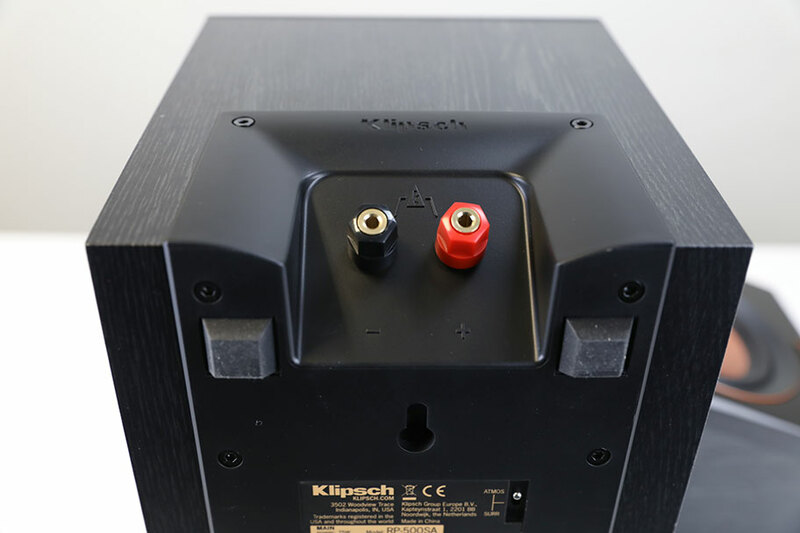 What's clear is that Klipsch have designed these to sit neatly on top of their own speaker lines - it's easy, for example, to see one sitting on top of an RP-6000F speaker - another model in the Reference Premiere line. Unfortunately, not everyone owns Klipsch floorstanders, as good as they are. Perhaps the company should think about releasing a slightly smaller version to be compatible with other brands. The connections at the rear are a pair of simple binding posts. Even when wall-mounted, we found that there was enough room to attach a pair of banana plugs, screwed into our speaker wire. While we did notice that the plugs jutted out slightly – meaning it may be a little difficult to mount these absolutely flush in a corner – it wasn't a major issue. For the most part, connecting these speakers is as straightforward as it gets. There's very little to get excited about here. These are a pair of home theater speakers, and as such, you shouldn't expect dramatic or exciting packaging. Putting the cardboard box aside, the main accessory is a set of magnetic grills. They are basic black, and we suggest leaving them off. Because if you don't want a little bit of black and gold in your life, you clearly have a heart of stone. 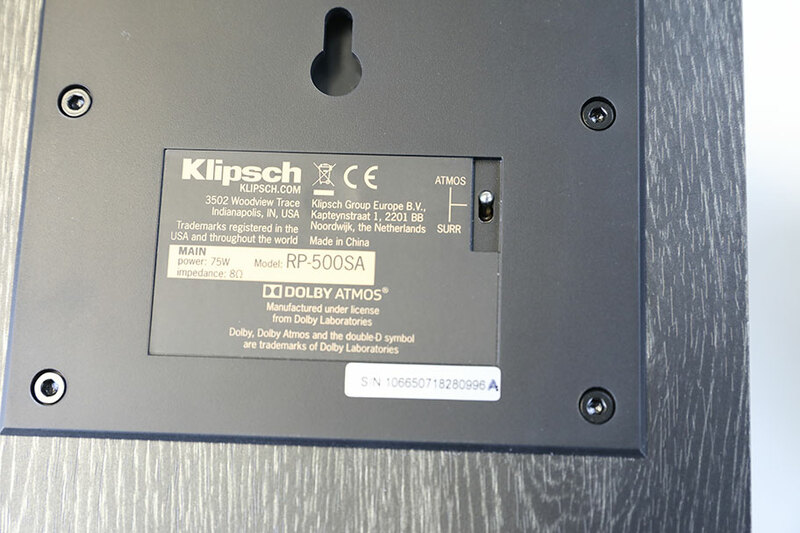 The Klipsch RP-500SAs deliver clear, engaging Dolby Atmos height sound, with solid detail. The high-end is surprisingly agile and elegant, and the RP-500SAs impressed us with their verve. The design of the RP-500SAs is excellent - robust, sleek, with some great highlights. The Klipsch RP-500SAs don't function well as a surround speaker, regardless of the fact that they are designed to handle this. Their large size may cause an issue if positioned on top of smaller floorstanding speakers. They are a little more expensive than other comparable Atmos speakers. 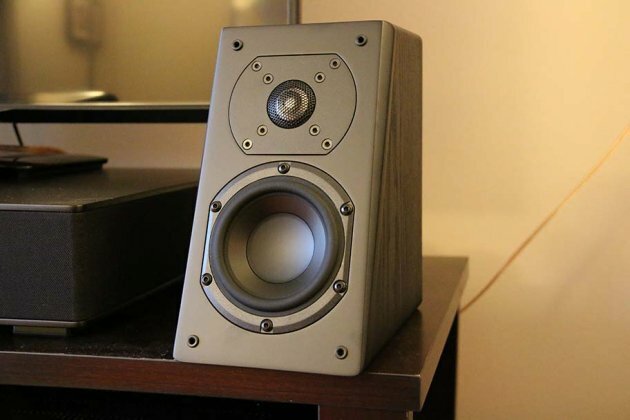 The most obvious competition for the Klipsch RP-500SAs are the SVS Prime Elevation speakers. They may not have quite the precision and dynamism of the Klipsch speakers, but they are still an incredibly appealing proposition. They are more versatile, and not quite as top-heavy or large, meaning they will fit more naturally into your listening space. Despite their small size, they managed to kick out some powerful, realistic sound, and are quite capable of filling the space above your head with all sorts of wonderful nonsense. They are the same price as the Klipsch, at $399. Definitely investigate these if you want to save some money. The ELAC Debut 2.0 A4.2 are another good alternative. There's no wall mounting necessary – these are specifically designed to be placed on top of an existing pair of speakers, and bounce soundwaves off the ceiling. In our opinion, this does diminish their standing just a little – it's an outdated approach that the Klipsch and SVS models are clearly designed to rectify. It also makes them less versatile. However, that doesn't mean they aren't worth your time. For one thing, they're affordable, at $250. For another, the audio quality from the speakers is at least as good as the SVS. If you have your heart set on up-firing speakers for your Atmos rig, then these are definitely worth a look. Then there are the KEF Q50As. They are more expensive than the Klipsch speakers, at $500. The downside is that they cannot be wall mounted; the upside is that, even though they will be bouncing audio off the ceiling, you'll be in for some truly magnificent sound quality. When it comes to a race between KEF and Klipsch, we'll take KEF every time. The sound quality when we last heard them was magnificent, with incredible depth and realism. They aren't as versatile as the RP-500SAs, but they remain excellent. And you can always mount them in the ceiling if you feel like doing a little DIY. 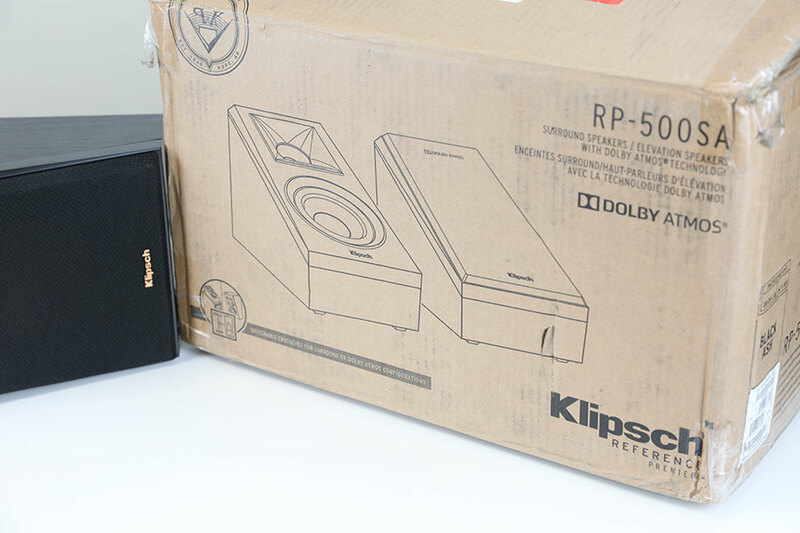 And last, but not least, another Klipsch model: the RP-140SA. As we admitted above, we didn't have a pair of these to directly contrast with the newer model, but we don't think there are too many dramatic differences. The design and audio quality of both are extremely similar, but the one thing that the RP-500SA has that its older brother doesn't is the switchable crossover for use as a rear or side speaker. In our opinion, it's not really worth using the RP-500SA in this manner, so it's a perfectly viable option to go for an old pair of RP-140SAs.